PRESIDENT DONALD TRUMP’S oldest son has released a series of direct messages he received from the Twitter account behind the WikiLeaks website, including his responses to the communications. Donald Trump Jr’s release of the messages on Twitter comes after The Atlantic first reported them. 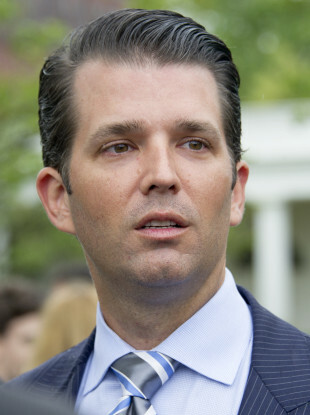 In the exchanges – some of them around the time that the website was releasing the stolen emails from Democrat Hillary Clinton’s campaign chairman – WikiLeaks praises his father’s positive comments about WikiLeaks and asks Trump Jr to release his father’s tax returns to the site. The private messages released by Trump Jr show him responding three times, at one point agreeing to “ask around” about a political action committee that WikiLeaks had mentioned. He also asked the site about a rumor about an upcoming leak. The messages released by Trump Jr began in September 2016 and run through July 2017. In one message dated 3 October 2016, the WikiLeaks Twitter account sent Trump Jr an article that included critical comments Clinton had made about WikiLeaks editor Julian Assange and said “it’d be great if you guys could comment on/push this story”. Longtime Trump associate Roger Stone had tweeted the day before that on Wednesday, “Hillary Clinton is done,” referencing WikiLeaks. The WikiLeaks Twitter account never responded, but days later WikiLeaks started rolling out Podesta’s stolen emails. After the emails were released, WikiLeaks sent Trump Jr a searchable link of the emails. Trump Jr tweeted that link two days later, on 14 October 2016, The Atlantic noted. The rest of the messages are one-sided, with WikiLeaks sending Trump Jr messages through July 2017. They include praise for his father for mentioning them on the campaign trail, a plea to release Trump’s taxes to the site and advice on Election Day that Trump should not concede if he lost. One message suggested Trump encourage Australia to appoint Assange as US ambassador. In July, the Twitter account messaged Trump Jr to ask him to give the site emails surrounding a meeting he and other Trump associates held with Russians during the campaign. Trump Jr then released them himself. Vice President Mike Pence responded quickly to the revelations, issuing a statement through his press secretary that he knew nothing about the situation. Assange tweeted after The Atlantic report that he couldn’t confirm the messages but then defended them after Trump Jr released them. “WikiLeaks appears to beguile some people into transparency by convincing them that it is in their interest,” Assange tweeted. Email “Trump Jr releases messages with WikiLeaks during 2016 campaign”. Feedback on “Trump Jr releases messages with WikiLeaks during 2016 campaign”.